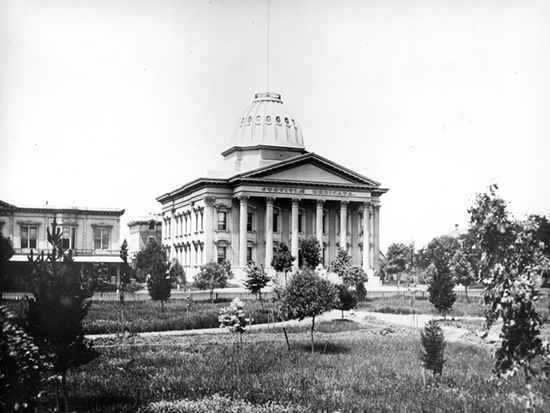 During California's first 15 years of statehood, Santa Clara had no fewer than five courthouses, beginning with an adobe juzgado, or Mexican courthouse, and ending with this Roman Corinthian landmark on St. James Park. The building withstood numerous earthquakes and fires, including a disastrous blaze in 1931 that gutted the building. Damage sustained in the 1989 Loma Prieta earthquake nearly led to its demolition, but after a $12.4 million seismic retrofit and restoration project the building was reopened in 1994 and is still in use today.